JNN 25 Jan 2014 Cairo : Militants have stepped up their campaign against security forces in Egypt with a series of explosions in the Egyptian capital, Cairo. 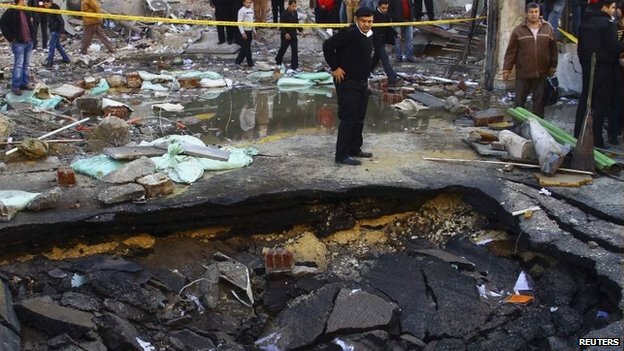 Six people were killed and some 100 others wounded, with the biggest blast outside Cairo’s police headquarters. The explosion outside Cairo’s police headquarters left four people dead and wounded at least 76. The authorities blamed the Muslim Brotherhood for that attack – something the group strongly denied – and declared it a terrorist group shortly afterwards. An angry group gathered outside the bombed police headquarters, accusing the Islamist movement of being behind Friday’s attacks. Some shouted: “Death to the Muslim Brotherhood”. The Muslim Brotherhood condemned what it called the “cowardly bombings”. Brotherhood supporters and security forces clashed in Cairo and several other provinces on Friday, with at least seven people reported dead. The interior ministry said it had arrested 111 people, saying they were “Brotherhood elements” who were “trying to provoke riots”. “A pick-up truck had two passengers inside, stopped outside the security cordon, and the suicide bomber blew himself up,” he said. The nearby 19th Century Islamic art museum was also damaged. “The building has been destroyed from the outside, but with regards to the antiquities we’ll have to wait and see until we can carry out a thorough inspection,” said Antiquities Minister Mohamed Ibrahim. The BBC’s Orla Guerin, reporting from Cairo, says the security directorate is a very significant target and should have been one of the best-protected buildings in the city. The interior minister said security is being stepped up around the squares where people are expected to gather to mark Saturday’s anniversary. Supporters of the Muslim Brotherhood are angry at the army’s overthrow of Islamist President Mohammed Morsi last July – a year after he became Egypt’s first democratically elected leader. He accepts the new constitution… refuses the use of force and he accepts the idea of a secular government, democratic one, open, no discrimination, no mixing of religion and politics, and accepting human rights,” Mr Beblawi said in a BBC interview before the attacks. Amnesty International on Thursday condemned the military-backed government’s period in office as one of “unprecedented” violence. It accused troops of regularly committing abuses and said rights and liberties in the country were being eroded. “There is no end in sight. It could in fact go for up to two years,” Mr Greste’s father Juris told Australia’s ABC channel, referring to the repeated cycles of detention allowed under Egyptian law. Greste – an ex-BBC correspondent – was arrested on 29 December along with Cairo bureau chief and Canadian national Mohammed Fahmy, and Egyptian producer Baher Mohamed. They have been in detention ever since. Also on Friday, the German ARD TV channel said that three of its employees had been attacked by a mob while filming at the site of the blast at Cairo’s police headquarters. This entry was posted in AFRICA, Middle East and tagged Cairo, Egypt, Islamic Art Museum, Journalist, militants, Mohd. Morsi, Muslim Brotherhood, police headquarters, president hosni mubarak. Bookmark the permalink.